Hi all! I’ve been working furiously on ThinkTank over at Expert Labs for about six weeks now. Once in awhile I’ll post an update on where we’re at with the project. This is such an update, and it’s cross-posted from the Expert Labs blog. 1. Facebook Integration. 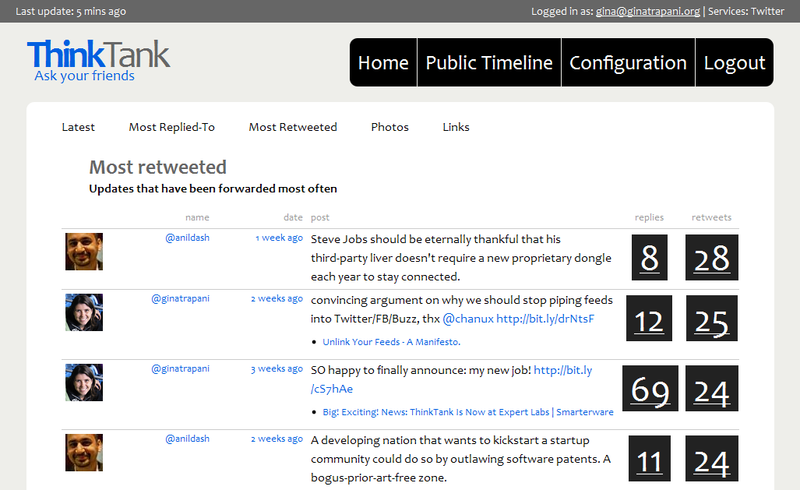 We’ve been working hard to make ThinkTank an extensible platform that any social network can plug into. We’ve just abstracted ThinkTank’s Twitter functionality into a plug-in prototype, and it’s time to try out plugging in another data source. Its popularity makes Facebook the next logical choice. To start, we need to add Facebook Connect functionality to the ThinkTank webapp, which will allow users to grant ThinkTank access to their Facebook account (much like you can via Twitter OAuth right now). If you’ve got experience implementing Facebook Connect in PHP, please help us build this plug-in. 2. Google Buzz Integration. Buzz may have just launched, but its instant adoption by millions of Gmail users (and its open APIs) makes it a perfect fit for ThinkTank. Like Facebook, we want to develop a Google Buzz plug-in that will feed posts and replies to those posts on Buzz into the ThinkTank database. Keep in mind that ThinkTank’s plug-in framework is still under development, so we’ll be refining it as we work on getting new services interfacing with ThinkTank. 3. Documentation. A big barrier to users and developers getting involved with ThinkTank is the lack of thorough documentation. While we’ve gotten several pages started in the ThinkTank wiki, we need more. If you’ve installed ThinkTank or plan to, document your experience in an installation guide. As you dive into the code and grok the app’s design, add and edit the developer’s guide. Documentation is one of the more tedious parts of developing code, but it saves future users and developers so much time, and it’s the perfect way for non-coders to help out with the project. You don’t have to ask permission: if you’ve got helpful information to share about using or developing ThinkTank, dive right into the wiki and press that Edit button. While these are the project’s major priorities right now, ThinkTank has over 30 open issues large and small. If you’re interested in improving ThinkTank for your personal use as well as helping better-inform public policy, join us on the mailing list, follow and fork the project on GitHub, install ThinkTank and contribute what you can. Thanks in advance for your time and interest.